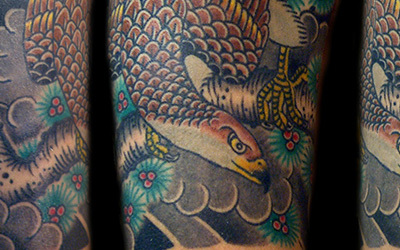 Chris particularly reveres the work of Cap Coleman, and continues to use a basic palette of three colours in his traditional tattooing in homage to Cap’s work. 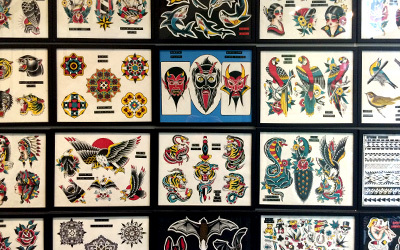 Western traditional is something of the “house style”, and customers are assured an authentic tattoo with modern tools. 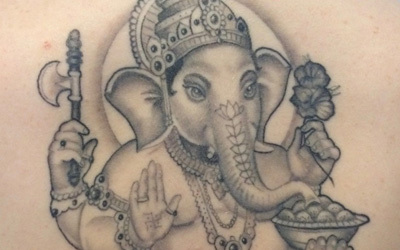 Chris is committed to the lineages and traditions of the art-form, understanding that traditions and tropes exist for a reason, particularly in tattooing – these classic techniques and designs are timeless; they work well on the skin, look better with age, and will remain a thing of beauty forever. Complex colour palettes arrived in Western tattooing in the late 19th century. Before then, inks were predominately black and shades of grey, often made from lampblack or gunpowder and applied painstakingly using single needles. 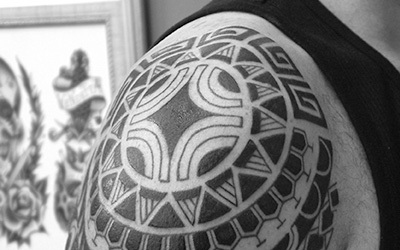 Tribal work augments and works with the natural shapes of the body, sits strong and stark on the skin, and will literally last a lifetime. See various articles about Chris Lambert and the team at Snake & Tiger from around the globe in the Press section.